Can you believe July is here and almost over? We're in the second half of our summer and I thought I would share some products that I have gotten so far this summer. They are not products that just launched but things I have picked up and decided to try. Plus, they are all affordable especially for a beauty recessionista! Queen Helene Grape Seed Extract Peel Off Masque This can be found at your local drugstore, such as Rite-Aid near the other facial products such as St. Ives. It costs around $4 for a 6 .oz container. On the label, it claims to cleans clogged pres, softens facial lines and soothes and tones skin. I've heard Grape Seed is a wonderful antioxidant and can help restore/repair skin. It is especially great for combo/oily skin. I've used this several times already and although i wish it would clean my pores better, my skin feels smooth and refreshed after each time. It also smells grape-y and pleasant. Note: It is important to have the mask dry completely before you try to take it off, otherwise it won't work as well. Queen Helene 100% Cocoa Butter stick Another Queen Helene product, the cocoa butter stick I purchased was pure luck. I went into a CVS drugstore the day I went to the Women's Health Are You Game event and was browsing. I had read that cocoa butter was an excellent natural moisturizer for your skin and can reduce stretch marks and discoloration of blemishes. I knew that Palmers carried a skin care line with Cocoa Butter and I was looking for something that didn't have any other chemicals as well. So I was lucky to find the Queen Helene 100% pure cocoa butter stick right next to the other one. It was also a bargain for about $1! 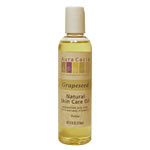 Grapeseed Oil To continue my natural skin care kick, I also got a bottle of grapeseed oil, which contains grapeseed oil and vitamin E. You can use this oil for aromatherapy bath, massaging or just plain moisturizing. So far I have incorporated this product after cleansing my face and moisturizing my face. It feels, of course, oily so I have to be careful to use very little of it for my face. A 4 .oz bottle costed me about $5. All in all, I got 3 great natural skin care products for $10! What a bargain!